Whenever we receive a new submission I have to confess I think to myself who am I to decide what is worthy, I haven’t built anything yet! All I have done is purchased myself an angle grinder and have been swinging it on scrap metal! The way I see it the custom motorcycle world is like a big giant puzzle. Whilst some pieces may seem rather simplistic they are equally as important as the complex pieces. If we are going to be truly worldwide we need to find all the right pieces, which fit our puzzle. 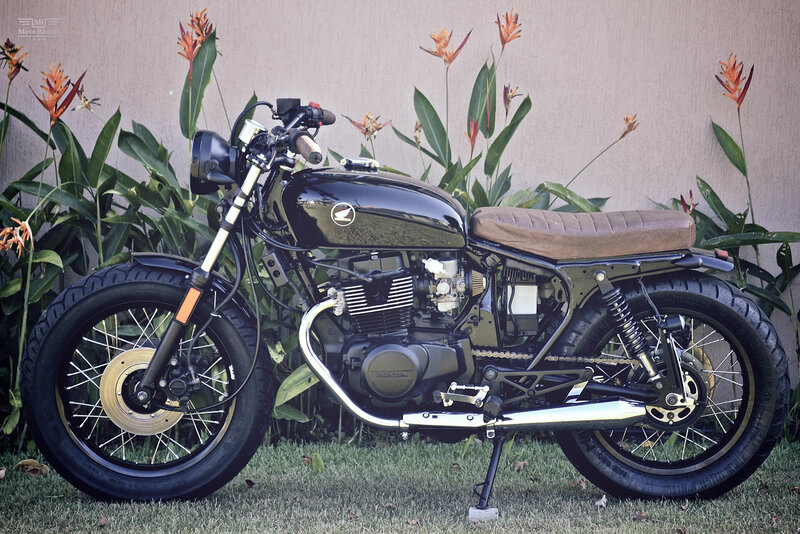 Today’s feature build a Honda CB450 is another piece of that puzzle. 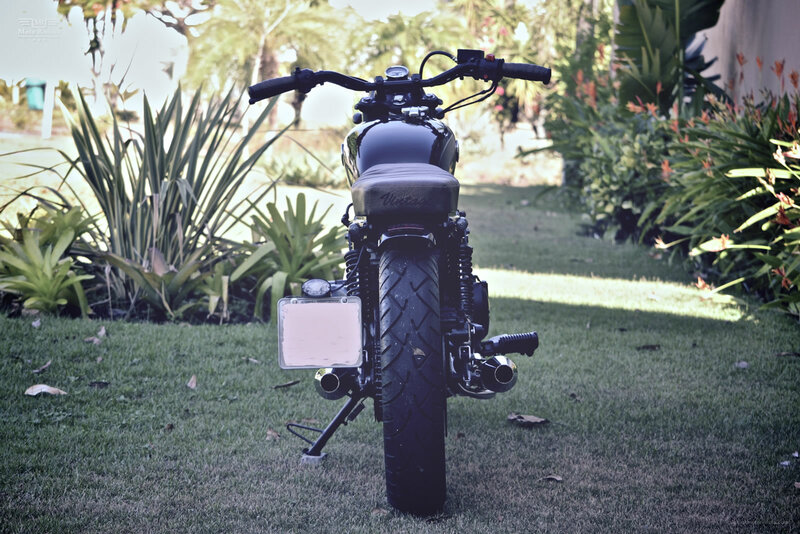 For the first time on Moto Rivista we are featuring a custom from Brazil! We were stoked to receive an email from Marcelo Wittlich, firstly because he dug our site and was inspired by the builds we have featured and secondly because we think he did a mighty fine job! Marcelo tells us it was no easy feat because it is impossible to find equipment to customize your bike in Brazil. But he had a goal, he wanted to build himself a Café or almost a Café as he describes it. 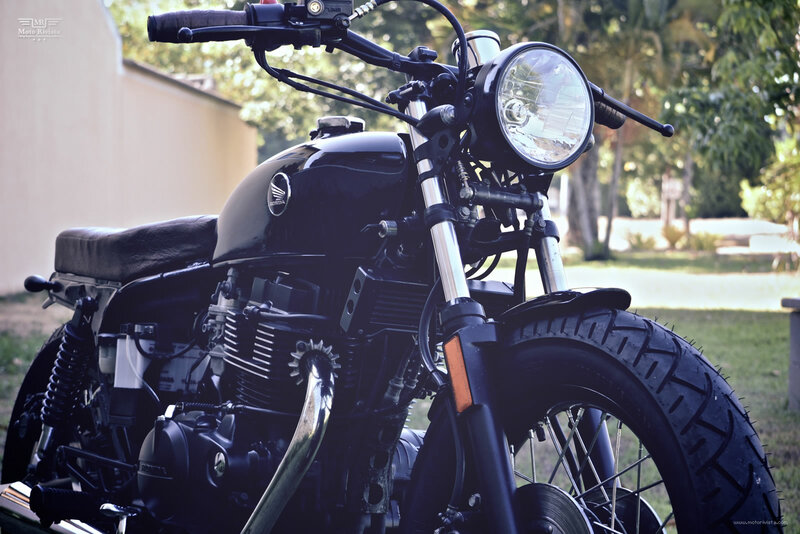 The base for the build was a 1988 Honda CB450, which is usually the perfect donor for Café style projects. To begin the build the bike was stripped down to the frame, which was modified at the rear to accommodate the low seat. 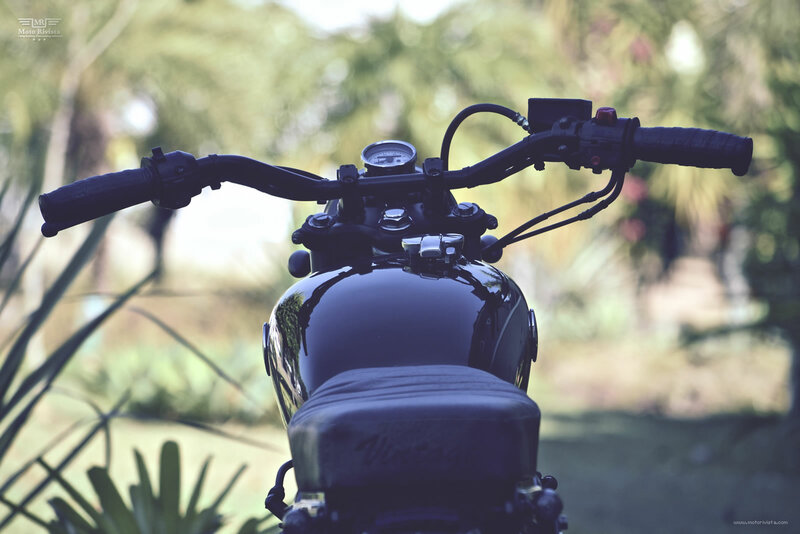 At the front this custom Honda CB450 features old school handlebars with old school grips. 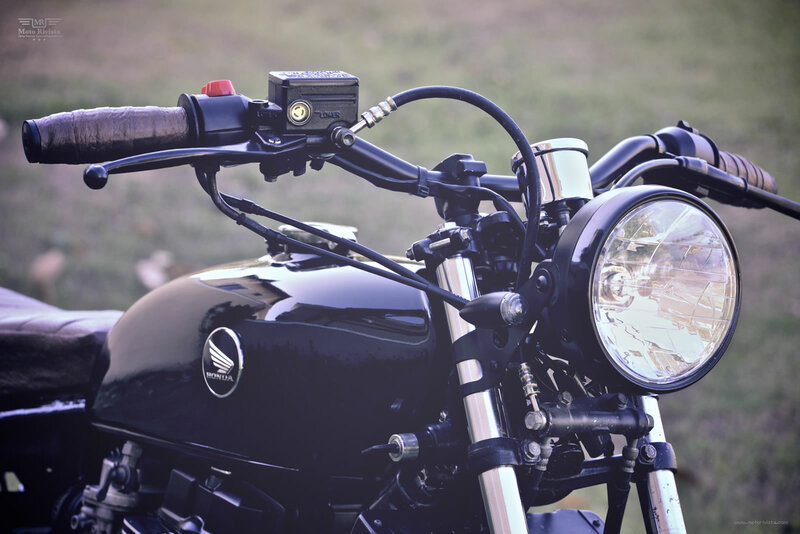 The front headlight is from a Honda 125cc, and the ignition key is mounted on the side frame. The engine was cleaned up and painted in frosted black, the air filter is an External Conical and the pipes are from Old school. The wheels were built using an original center hub with new 18-inch front rim and 17-inch rear rim, wrapped in Metzeler Marathon front 120x90x18” and rear 140x80x17” tires. The stock speedo was replaced with an old school English style. The fuel tank is from a 1972 Honda CB350. Fabrication work includes a side mount homemade license support and fiberglass front and rear fender. We have seen it many times before, how quickly this culture can grow. 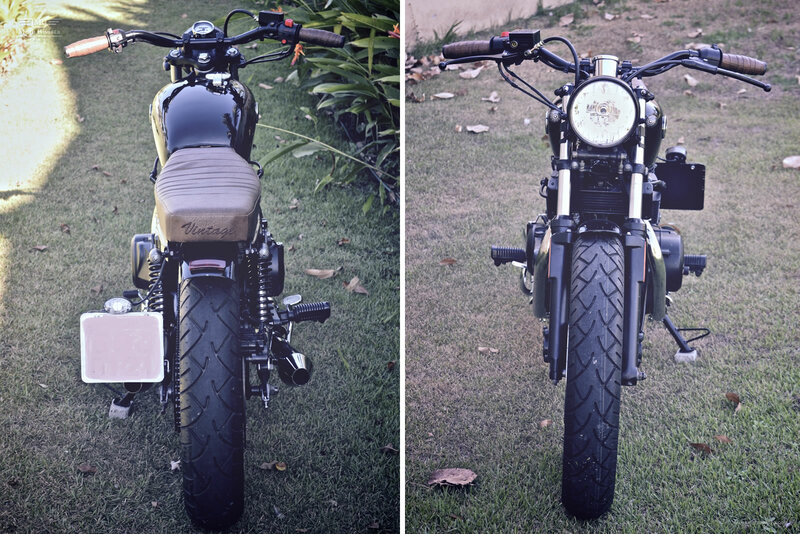 This custom Honda CB450 might be the first spark of the Brazilian custom scene to hit Moto Rivista, but I am sure it won’t be the last. Come on Brazil the door is open we want to see more from you!! Many thanks Marcelo for sharing your build with us.